Thinking Of a Cheap System? THINK AGAIN! Don't go halfway when you go solar. Invest in a high-quality system that will work well for years to come, giving you the biggest return on your investment. Choose AdtechEco in Newcastle when it's time for your home or business to switch to a renewable power source. We understand that customers want to use their money wisely. However, choosing an extremely low-priced solar power option may be cheap, but it isn't wise. You'll be much better off in the long run by investing in a durable, efficient system from a trusted provider. That way, you'll avoid sub-standard products, hidden costs and problems with the installation. Upfront pricing. We won't hide fees to surprise you later. The price we tell you when we begin the installation is the price that you will pay. Experienced tradespeople. All our installations are done by our employees, not subcontractors. You can trust our employees to be fully trained and able to install your solar system without hurting your property. Excellent solar panels. All our panels are durable and worth the investment you make in them. System design. Our design engineers optimise your solar panel arrangement, helping you get the best system performance possible. After-sale service. We don't disappear after we make the sale and install your system. If you have a problem, let us know, and we'll work with you to get it fixed. AdtechEco wants to make sure your system works as well as possible and that you're fully satisfied. 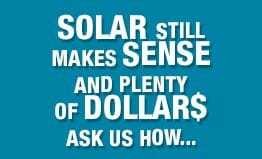 Choose us when you need a solar system. If you're interested in going solar, contact us. Either fill out the contact form at the bottom of this page or call us on (02) 4962 2466. We look forward to hearing from you.